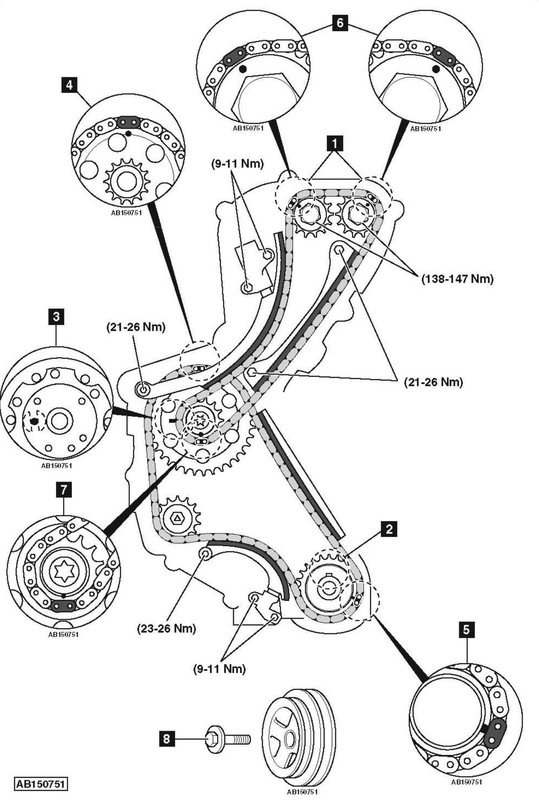 Nissan Pathfinder R51 2.5D dCi 2004-10 timing chain change instructions and replacement inteval. Full guide! Crankshaft pulley holder – No.KV10109300. Crankshaft pulley puller – No.KV11103000. High-pressure fuel pump sprocket locking tool – No.KV11106030. NOTE: Timing chain marks on high-pressure fuel pump sprocket maybe difficult to see. Ensure engine at TDC on No.1 cylinder  . Secondary timing chain and tensioner. High-pressure fuel pump sprocket and primary timing chain. Ensure crankshaft sprocket keyway at 12 o’clock position  . Install high-pressure fuel pump sprocket and primary timing chain. Insert high-pressure fuel pump sprocket locking tool  . Align silver coloured primary chain link with high-pressure fuel pump sprocket timing mark  . Align yellow coloured primary chain link with crankshaft sprocket timing mark  . Align silver coloured secondary chain links with timing mark on each camshaft sprocket  . Align yellow coloured secondary chain link with high-pressure fuel pump sprocket timing mark  . Push plungers into tensioner housings and lock with retaining clips. Lubricate crankshaft pulley bolt during assembly. Tighten crankshaft pulley bolt to 75 Nm. Slacken 360°. Tighten to 75 Nm + 120°  .